When travelling on North Dakota roadways, you can regularly expect to deal with hazardous construction zones. Signs, heavy equipment and even construction crews can be dangerous obstacles while navigating the roadways. If you were injured in a construction zone, the experienced North Dakota construction accident lawyers at the Larson Law Firm P.C. understand the physical, emotional and financial burdens of a construction zone crash. With more than 35 years of experience handling accident and personal injury cases, our attorneys do not rest until you receive the full and fair compensation you deserve. If you were injured in a construction zone, we investigate to determine what caused your car accident and who was at fault. By law, North Dakota companies and agencies involved in managing construction projects must follow state and federal safety regulations. It is their responsibility to keep roads safe for motorists, including the safety of employees and pedestrians. For example, if you work in a construction zone and are injured by faulty equipment or falling debris, construction companies, contractors, and agencies that oversee the project and equipment can be held liable. Even if you walk through a construction zone and break your leg after tripping over a dangerous hazard, you deserve to be compensated for your injuries. 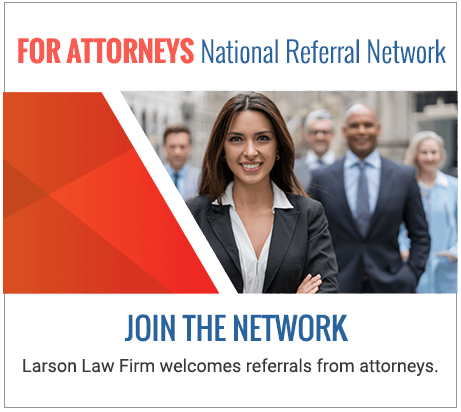 Turn to the experienced legal team of Larson Law Firm P.C. if you have been injured in a construction zone accident. We can answer all your questions and determine if you have a case. We provide legal services to injured parties across North Dakota, including the residents of Ward, Williams, McKenzie, Pierce and Mountrail Counties. Our Minot office is easily accessible with convenient parking available. Complete our contact form or call us at 701-484-HURT.